Let us share with our guests the warmth of our hearts and the rich beauty of our Kashmir. 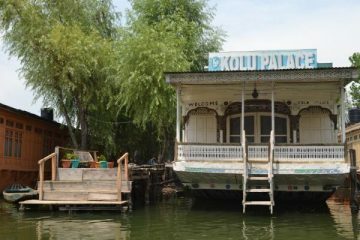 Kolu palace Houseboats only this name is registered with (Department of Tourism), Jammu and Kashmir,& House Boat Owners Association of KASHMIR. None of more Kolu name is registered with these departments. Abdul Salaam Kolu and his two sons, Mohd. Amin & Mohd. Ashraf currently own and operate five of the finest houseboats in Kashmir. Four generations of the family have preceded them in this activity. Their fine reputation has kept them at the forefront in welcoming guests from every corner of the world from several decades. They pride themselves in offering the kind of luxurious service which brings their guests back to Kashmir and to their houseboats time and time again. For many of these guests, it has become a home away from home – the home they cannot forget. You too are warmly invited to visit and enjoy the personal attention and courtesy which the family extends to each and every one of its guests at Kolu Palace Group of Houseboats. Attached baths with running hot and cold water. Dining hall for more than 50 pax.